Description: Zippered closure. Interior organiser with gusseted file pocket, business cards, calculator & front pockets. Features: Pen loop. Includes 216mm(w) x 279mm(h) writing pad. Pen & calculator not included. 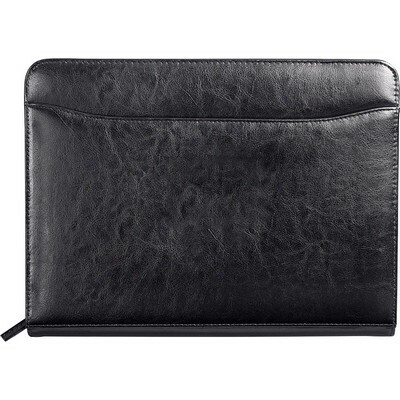 Made from bonded leather exterior. Packaging: Colour: Black Material: Product Size: 340mm(h) x 254mm(w) Freight details : 12 per carton, 9.7kgs, 38 x 29 x 36cms; Decoration Type(s): Colour Print / Deboss / Foil Stamp / Full Colour Print Decoration Area: Print: 120mm(w) x 170mm(h). Price includes : 1 Colour 1 Position Print. Setup is included.